So we traveled to two cities last week in search for the motor home in our price range. To no avail! Everyone that we looked at, the owner had not disclosed that it had, had a leak at one time. I can find a leak!!!!! I would point it out, and then they would say " Oh, well, that has been patched." On some, I saw where it had still been leaking down the wall!!!!!!!! Gasp!!!!!!! We have up to $10,000 to spend and that seems to be a problem in that price range. Get this! Most said on the phone that it was their personal vehicle, only to find out when asked, that it was not! They only had bought it to resell! We are now looking at bus conversions. Hopefully, no leaks! I see the comments are from 2011 so its an older post but I really wish they had posted what the ended up finding for 10k. That is the amount I am hoping to spend on a very small fulltime rv/van or truck camper. I have a F150 and so a very very little lite truck camper is an option also. I talked my grown daughter into a long road trip one Saturday to buy a carriage house van and she would drive my mustang back. Well I quickly realized that out of all the phone conversation with the sweet wife I should have ask to talk to the husband about the van. She said it had everything it was loaded all the options and like new condition. Even if it had the shower, generator, coach batteries and all the things she said it had I wouldn't have bought it due to motor issues, 10 year old tires, broke windshield, nasty interior. I was so broken hearted but optimistic that I learned from the experience and consider it part of the adventure. I will be sure to come back and post what I end up buying. My goal is rv by spring 2014 house and all this stuff sold by august then head down the long black ribbon in October. Rv's will eventually leak. The things to look for in that area is were the leak is, if it is patched up and if there is any structural support damage (sagging roofs). Don't say Oh I can't get on the roof. You will be getting on that roof. If they say the leak is patched ask by who and ask for the receipt also ask if you can test it with a water hose after verifying that it was patched correctly. On sealing and walls see if there is a lot of softness and saging or just the first layers but there is firmness. Check inside and out. If sagging walk away it will cost way to much unless you are a carpenter and can do the repairs your self. Also on a side note check the age of the tires if they are older than 7 years there is a good chance of having problems. When talking to a seller on the phone ask questions and write what they say down. Ask about the leaks and if any patches have been made. If they say there haven't been any leaks and you find them you may want to walk a way. They have been proven a liar and untrustworthy. If you still want to consider the rv test everything. 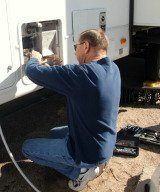 I was told by a reputable RV tech that all rvs leak, if they havent yet, they will. He also stated that you have to pay attention and manage them as they happen. I know how you feel my wife and i are in the same boat as far as the budget goes, good luck to you guys.